Our associate company, Magical Flowers, can create breathtaking bridal bouquets, flowers for the bridesmaids or to displays to decorate your wedding location. We can also create pretty nosegays or corsages to match gowns worn at proms and balls. Flowers have their own enchanting magic, adding that extra touch of perfume, texture and colour that is perfect for any occasion. We will work with any colour scheme that you choose and keep within your budget. We can assist you with planning your special day every step of the way to achieve your dream wedding, including both venue and reception. We can provide chair covers, table decorations and helium balloons. 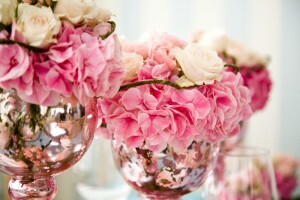 Magical Flowers can truly create sensational flowers that will enhance your event. Every display, every bouquet or corsage will be unique. We will find the flowers that match your colour scheme, your style of dress, and your venue. We can make suggestions as to what might work best in your chosen environment, as well as the flowers that will be available at the time of your event. Take a look at our floral gallery. Just click on the link to view our extensive examples of beautiful bouquets, corsages, nosegays, table decorations and more. Bear in mind that these are only examples – we can do much more. These are only some of the many flower arrangements we can provide. Talk to us about your requirements and we will create unique bouquets and floristry that will enhance your dress or your venue. Contact us for more information and to arrange a time to chat about your needs. We are very happy to help and make suggestions. We can even arrange to choose your flowers at the same time as you choose your dress, thus ensuring that colours, styles and themes co-ordinate perfectly.